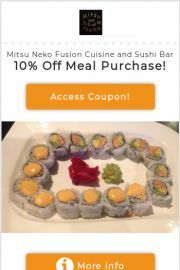 If you’re looking for the best Branson Mitsu Neko Fusion Cuisine and Sushi Bar coupons, you’re in the right place! At Mitsu Neko, they strive to give the very best food quality, using healthy, fresh, and natural ingredients. They’ve got enthusiasm for food with supporting local patrons and new visitors alike!